Beleaguered Irish broadcaster Setanta has confirmed it has stopped taking on new customers as it "attempts to secure the future of the business". In a message to customers on its website, the firm stressed it was not in administration and that it was broadcasting all channels as usual. Setanta has been holding emergency meetings to discuss survival plans. There are conflicting reports from sources close to the company over the firm's future should it collapse. 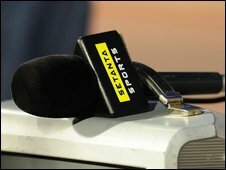 "As has been widely reported in various media channels, the management of Setanta Sports management is in the process of attempting to secure the future of the business," the broadcaster said. "In the current circumstances, we have decided to suspend temporarily the acceptance of new subscriptions." Meanwhile BT Vision said that while Setanta was still available in its packages and as a stand-alone channel, it was no longer advertising the service. Setanta's founders Leonard Ryan and Michael O'Rourke are in talks with backers to secure financing to keep the firm going, according to some reports. Meanwhile US sports broadcaster ESPN is also said to be interested in either buying the Irish firm for a nominal sum or simply bidding for its rights to English Premier League matches. ESPN, which has been expanding in Europe, has remained quiet over its investment strategy. But it missed out on acquiring the rights to English football's top league when they were auctioned earlier this year. It has emerged that rival broadcaster BSkyB refused a £50m lifeline to Setanta. Setanta had offered access to its live rights for 46 English Premier League games next season as an add-on option to Sky Sports, in return for the cash. BSkyB's chief executive, Jeremy Darroch, said that his firm had been "talking to Setanta, and trying to work with them and help them", but that it could not agree to the proposal. "At the end of the day, we are not a bank, we are a broadcaster, not a supplier of working capital to a business and rights holder," he said. "Our job is not to fund other companies. This is a huge amount of money." Setanta, which shows cricket, golf and rugby union as well as football, has about 1.2 million subscribers. But this is only about 60% of the number it needs, according to analysts, and the company is losing up to £100m a year. Setanta needs to pay £30m that is due to the English Premier League and has already failed to pay the Scottish Premier League £3m it owes in television rights money. Analysts widely expect that anybody picking up Setanta's sporting television rights would pay less than the amount paid originally. Under the current UK broadcast deal for the English Premier League, which lasts for one more season, BSkyB holds four packages of rights to show live matches next season - a total of 92 games - while Setanta has the other two packages - which cover 46 games. Under European Union competition rules, BSkyB could not hold all of the rights packages. However, Setanta could act as a wholesaler - retaining the rights, but then selling on the football coverage, which rivals would show through their channels. Some analysts say that this business model is the only way that Setanta can survive, rather than selling its coverage directly to customers. It already does this for Virgin Media, which makes Setanta channels available as part of its more expensive packages. Setanta would probably receive less revenue this way than by selling directly but it would potentially be able to reach a wider market, thanks to the marketing power of the likes of BSkyB. This business model would also allow Setanta save money, as it would not need marketing or customer services teams.